On 31 January 2018, Viet Nam champions the SUN Movement and leads the way for other SUN Countries in an event that also kicked off the implementation of the Prime Minister’s Directive on strengthening multi-sectoral collaboration for nutrition in the country’s new context. The event marked an important milestone for Viet Nam in its efforts to improve health and nutrition for the country’s citizens as well as in the fulfilment of its international commitments in these areas. 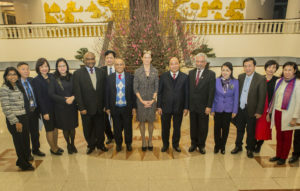 Participants to the event included Deputy Prime Minister Vu Duc Dam, Assistant UN Secretary General and Coordinator of the Scaling Up Nutrition Movement, Gerda Verburg, representatives from line ministries, government agencies and international organizations. Over the past decades, Viet Nam has made great strides in improving nutrition. The child malnutrition rate has significantly declined and food security has considerably improved. However, Viet Nam still faces many challenges in this area. Government data from 2015 shows a national stunting rate of 24.9 per cent, with wide disparities amongst ethnic groups – 15 percent stunting rates within the Kinh majority – and other ethnic groups with rates as high as 30.4 per cent. The rates seen in the central highlands are even more unequal, with 40.6 per cent among some ethnic minorities and 15.8 per cent amongst the Kinh. 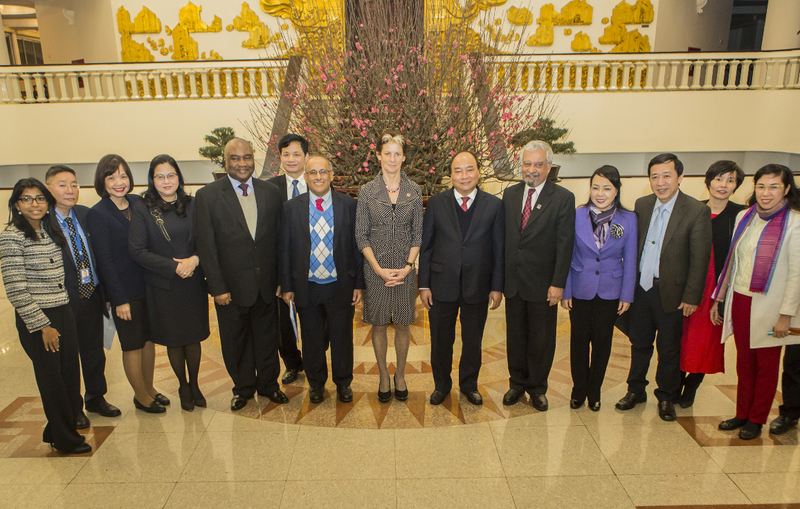 Viet Nam has demonstrated a strong commitment to promoting nutrition. In January 2014, Viet Nam officially joined the SUN Movement – a global movement that unites people from civil society, the United Nations, donors, businesses and researchers—in a collective effort to end all forms of malnutrition in the world by 2030. Launched in 2010, the SUN Movement is now led by 60-member countries including Viet Nam. As a member of the SUN Movement, Viet Nam has been leading the way to addressing malnutrition in all its forms and making this transformative agenda a reality for people in the whole country. Viet Nam has recently enacted and enforced two important pro-nutrition policies including the Communist Party’s Resolution No. 20 / NQ-TW and the Prime Minister Directive No. 46 / CT-TTg. However, more domestic investment is crucial for reaching the Movement’s goal of eliminating malnutrition by 2030. “For nutrition work, it is necessary to focus on raising awareness, changing behavior, raising the responsibility of the entire political system, the whole society and each citizen; To formulate and organize the implementation of schemes and programs on raising the health and stature of Vietnamese people, especially in rural, mountainous and island areas; To make recommendations, disseminate information on appropriate nutrition plans for each group of Vietnamese people; To deploy the necessary micronutrients programs for pregnant women, breastfeeding women, children, elderly people; To comprehensively implement non-communicable diseases related to nutrition, “said Minister of Health Nguyen Thi Kim Tien. At the event, Ms. Wivina Belmonte, UNICEF Deputy Regional Director for East Asia Pacific, emphasized the importance of nutrition in the first 1000 days of a child’s life and the role of nutrition in their development. She also expressed the confidence in the government’s strong determination to invest in nutrition and the commitment to continue supporting Viet Nam in this area. “We, as UNICEF, are committed to supporting the government in this strengthening of multi-sectoral coordination, which will bring a strong stakeholdership into the same fiscal space for implementation of the SUN principles. We are committed to bringing UNICEF global experiences in combatting nutrition to support the government”. In her second visit to Viet Nam since taking on the role as SUN Movement Coordinator in August 2016, ASG Verburg sees the nation as a great example that other countries in the Movement, and beyond, can learn from in its steadfast commitment to fighting all forms of malnutrition. “The 2011-2020 National Nutrition Strategy, developed by the Ministry of Health and ratified by the Prime Minister, in addition to the Directive on multi-sectoral collaboration in nutrition bear testament to the Country’s willingness to build on important achievements made, but also, perhaps more importantly, the acceptance that the fight is not yet over”, said ASG Verburg. “The 2017-2020 National Plan of Action for Nutrition (NPAN) offers Viet Nam a great window of opportunity to put nutrition at the heart of sectoral policies. This in turn can enable actors to catalyse funds needed to deliver a multi-sectoral approach to nutrition. There is no doubt in my mind that Viet Nam will be a leader in Asia, and also beyond, if it takes this comprehensive approach that also includes civil society and private sector – an approach that lies at the heart of the SUN Movement,” she stressed. Viet Nam has made great progress in combating both undernutrition and overnutrition over the past years, with notable achievements including significant decreases in child malnutrition – including reaching the Millennium Development Goal (MDG) target of reducing child underweight – and improvements in food security. The promotion and protection of breastfeeding seen in Viet Nam has proven a source of inspiration for many other SUN Countries, in the region and beyond.